We will have REGISTRATION throughout the summer for new and returning students. Returning students must register online. For new students, we will be available in the summer. 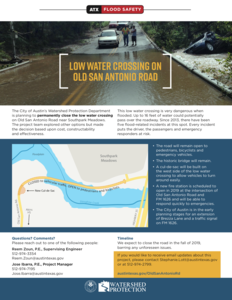 The City of Austin's Watershed Protection Department is planning to permanently close the low water crossing on Old San Antonio Road near Southpark Meadows. 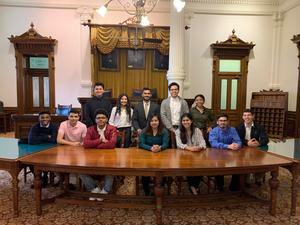 Future Austin Corps students participated in a forum about Latinas in politics. 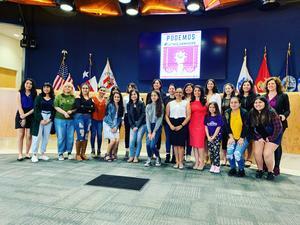 They met Lloyd Doggett, Gina Hinajosa, and Delia Garza, as well as campaign managers and city planners who are Latinas. Their stories were inspirational, and from our discussion afterwards, the young women were inspired. The above link provides information about next school year for students who plan to attend Akins High School for the 2019-2020 school year. According to TEA, Akins High School earned 3 academic distinctions in Comparative Academic Growth, Postsecondary Readiness, and Comparative Closing the Gaps. Congratulations! 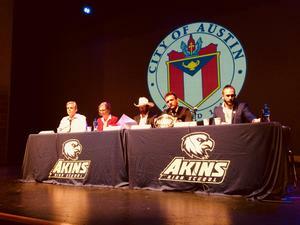 This new school year, Akins High School, is creating an additional way to communicate with parents, especially for important messages. Click above to register your parent name and phone number. Akins Journey Theatre wins 1st place for Best Lighting Design Category at GAHSMTA! Thank you to everyone who came out to support Akins Journey Theatre and Hairspray at the Greater Austin High School Musical Theatre Awards on the evening of April 18th at the Long Center. Akins Journey Theater ended the night with the first ever GAHSMTA award for Akins HS in the Best Lighting Design category.